We often get annoyed when we don’t get reply from the other person in turn around time. We start speculating whether the other person has read or ignored our email. Gmail is no longer a service which is used by only individuals. These days it is used by companies too. Even bosses wants to know whether their emails are read on time by their employees or not. A Chrome extension called MailTrack for Gmail can help you to check if sent email in Gmail has been read or not. In order to use this extension, you will have to open your Gmail in Google’s Chrome browser only. The basic version is free and you can use it for unlimited number of Gmail email addresses. Lets see how to do this and what other features it has. Step 1: Add MailTrack for Gmail in your Chrome browser using Chrome Web Store. Step 2: Log in to your Gmail email address. Step 3: Activate MailTrack by clicking on MailTrack menu from the top right. Step 4: Allow MailTrack to view and manage your Gmail email by giving it permission on the Google page. Step 5: It is ready. Whenever you will send an email to someone, you will see two tick marks when they read it. Until that it will be only one tick mark. Like WhatsApp messenger, it will show two tick marks when someone reads your email but wait there is more than that. When you hover over the double tick mark, it also shows on which device the user has opened your email. Whether it was on iPhone, Android, Mac etc., it can show that too. One can also check who all read email out of the multiple recipients of your email but you can track this only if both you and other people have this extension installed. 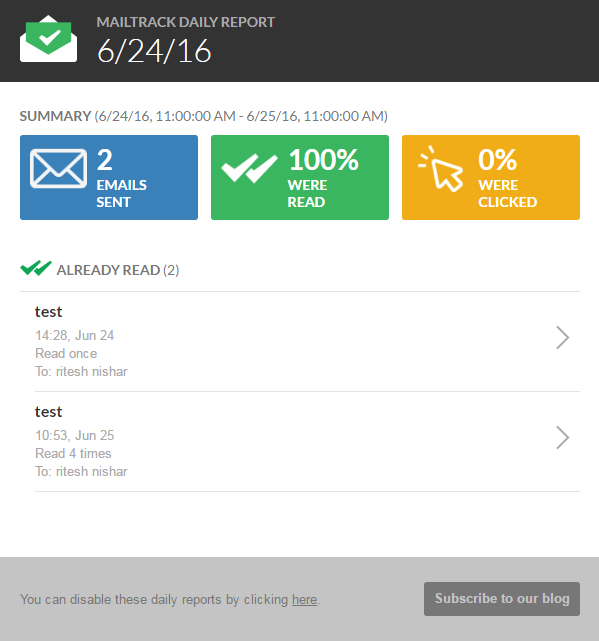 The extension sends you real time notifications when your email is read by the recipient. It instantly sends out a notifications along with the device on which it is opened (see image below). It also sends you real time notifications everytime when your emails are reopened. The extension also sends you email notifications when your email is read. So when you miss out any desktop notifications or hovering, you can still keep track of whether your email was read or not. 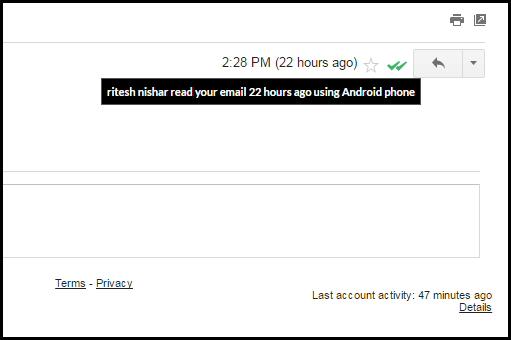 One can also get real time as well as email notifications when link in email is clicked. This is useful if you want your fellow employees to check particular link which you send them out in email. You will come to know who checked and who did not. One can also get daily report delivered to their email address at the time you specify. If you are a marketing person and you want to check your performance then this report can help you to target particular audience who is interested in your emails. The basic version of this extension adds signature to every email that you send but you can remove it using paid version. This extension is useful for individuals as well as companies who uses Gmail for all their formal communications. You can be rest assured once your email is read by the other person because you will expect a reply soon after you see that they just read it.